It was the offer of cow hormones that put him off. Well, that and the cocaine. Not to mention the EPO and steroids. 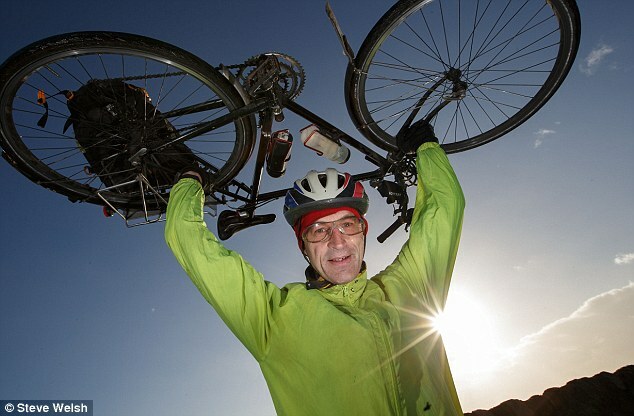 You see, despite his reputation as being more than a little bit ‘out there’, Graeme Obree never steered anything other than the straightest of paths when it came to doping. Or, rather, not doping. Laughing as he recalls the incredible package of performance enhancers thrust towards him in his ‘record-breaking’ one-day stint at French professional team Le Groupement back in 1995, the famously flamboyant Flying Scotsman – currently finalising a documentary on his successful shattering of yet another record – admits he did not always find it so easy to discuss a taboo subject. ‘It’s only 18 years later that I can talk honestly about this, without thinking I’m going to get sued,’ he admits, actually looking over his shoulder as he continues: ‘Because we all saw what happened with Lance Armstrong and the whole road scene. I was told everybody was doing it. And, at that stage, people knew they would not get caught. There was no proper testing. ‘But I thought: “I’ll train harder than you. If you think doping will get one over on me, I’ll show you”. At that stage, I’m still thinking they’re using amphetamines, a stimulant to make them reach deeper into themselves. I was reaching into myself to that level anyway, because of my obsessive behaviour. ‘But they had gone way beyond that. And I was not willing to believe there could be a physical advantage from what they were doing. ‘What you are really talking about, though, is growth hormone. Bovine growth hormone. On top of that, there were stimulants like cocaine, blood-boosting agents like EPO and steroids. ‘It was explained to me that this was £8,000 worth of stuff but I would get it for £2,000 off my contract, for medical back-up. They were saying to me: “It’s a bargain, a no-brainer. What are you thinking turning this down, Graeme?”. ‘I wasn’t going to play along, so they decided I was a loose cannon and it was basically goodbye. I hold the world record for the shortest ever professional contract – 11 hours with Le Groupement on January 1, 1995. ‘I had agreed to join at the end of 1994, as a short-distance specialist to help the other riders get into the yellow jersey position. I was a speed merchant, so I would be great in the prologues, a 4k world champion doing 4k laps around the streets against the clock – any team would want that. ‘So I had the hour record, the world pursuit title as a track cyclist, then get attached to the road time and help the riders out. That was my remit, as well as trying to get the hour record back. ‘It was the start of a tough time. My brother had died, I lost the hour record, I wasn’t world champion because they banned my riding position, I had no sponsor, I couldn’t ride that bike any more – and I was fired from my French team because I wouldn’t take drugs. Woah, woah. The Superman position? How did we get on to that? Spend any time with Obree and you quickly learn that conversation is not necessarily a lateral concept; he flits from subject to subject, only eventually returning to the original course. The Superman position was a revolutionary new riding style, with his arms stretched way out front on handlebar extensions, forming a massively powerful arch with his body. The second major innovation by Obree, who had already infuriated officialdom by rewriting all logic to create that famous hunched position, seemed obvious to a guy who does not see the world as others do. After getting lapped by a competitor on his first outing, he stuck with it – and ended up regaining the world title for individual pursuit. Yet still the pro teams shied away, knowing Obree would not juice up – and probably suspecting he might just blow the whistle on the whole doped-up circus. Sitting in a wee café in his home town of Kilmarnock, our conversation turns towards the aforementioned Mr Armstrong – now exposed as one of the biggest cheats in sport – and a certain day when the multiple Tour de France winner brought the streets of Paisley to a standstill. Obree was there among the adoring fans as Armstrong took the accolades on a massed ride in 2009; the American was still the good guy, still revered, still capable of impressing even a former world beater. Looking back, does Obree not feel great anger and bitterness towards a man who has come to symbolise all that was wrong with road cycling? ‘I remember that – that was some day,’ he said. ‘I could have done what Lance did, you’re right. I could have had the bling or the honour – that was the choice. But I can see both sides. ‘I was winning bike races without it. I was lucky to come from a background where you go out to Hansel Village, get changed in a layby, ride up the dual carriageway, fastest against the clock and somebody hands you an envelope with 80 quid in it if you win. If you took an aspirin to try to go quicker, that would have been a scandal. That’s the background I came from. ‘But, if you were a road cyclist being groomed from the age of 15, going through the larger amateur clubs, it was very different. I could name five Scottish guys who were good enough to be professional riders – but they would not do the doping. I’m just the one who stands out. With those teams, there came a point where someone would just say: “Son, here’s the kit”. ‘It’s normalised. It doesn’t seem like cheating. But I didn’t come from that background, so it was a shock. ‘I was training to be a receptionist two weeks before breaking the world hour record. Getting changed in laybys, picking up 30 quid for a race because I was a bit tight for money, that was my life. ‘When I broke the world hour record, people offered thousands, so I was saying: “I’ll be there!”. Suddenly, I was riding all over the Continent. ‘When the top pros met me, we would be chatting and then someone would ask: “What did you use for your world hour record?”. When I said “nothing”, they looked at me not with surprise – but disgust. It’s a very magnanimous attitude from a man who, but for riders like Armstrong, could have enjoyed a comfortable and lucrative lifestyle riding on the Grand Tours. He might even have had an Olympic medal, one of the few honours to elude him, to show his sons. Explaining his lack of fury towards the men who took the easier path to success, Obree says: ‘I’m resentful to road cycling. When I became a road champion under my steam and my money, in Colombia in 1995, there was not a single inquiry from a road team. I was the fastest man in the world over a short distance, but nothing. ‘Before the ’96 Olympics, a competitor apologised to me in advance because he was going to have to take drugs. He said everybody else was, so he had no choice. He was truly torn up by it, so he apologised because he knew I was clean. Everybody knew who was and who wasn’t. I was the one who stood out, even refusing vitamin injections because of a needle phobia. Obree gives off the impression of always trying to see the best in people and situations, constantly checking himself whenever there’s a suspicion of falling back into the depression that led him to suicide attempts during the darkest days. Writing two books helped – a life story later turned into a movie and a hugely respected training manual. He’s also working on what he calls a survivor’s guide to depression, spending entire days – from six in the morning ’til ten at night – rattling out chapters in longhand. Maybe he’s just filling the gap left by the conclusion of his latest project, breaking yet more records in a bike named – by Sir Chris Hoy, no less – The Beastie. Lying down, head first, on a home-made chassis surrounded by a high-tech shell, he broke the top speed set by a bike, then the overall record for a prone human-propelled vehicle, reaching over 56 miles an hour. ‘The bike was at the cutting edge of concept,’ he explains. ‘I could have just copied everyone else. But I was never going to do that. ‘I took my design to somebody in the cutting edge of car design, his grasp on aerodynamics was incredible. There are so many preconceptions about aerodynamics that I had accepted – but are totally wrong. The entire record bid, from conception and construction to execution, has been captured on film by Glasgow movie makers Journey Pictures, with a view to releasing a feature-length documentary. More than 200 hours of footage was shot and Obree says: ‘It was as if, every time I looked around, the camera was there. And the most stressful moments, when you would be thinking: “Just p*** off with that camera!”, they were the moments they wanted. Part of me dreads seeing the stress on film.